Our first morning in San Blas, Mexico, Bob and I awoke to the sounds of Great-tailed Grackles, church bells, and seabirds. 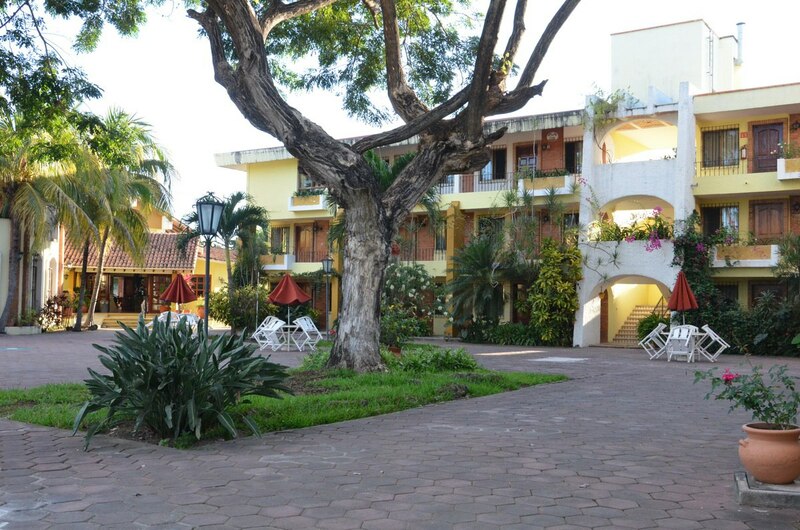 From our third-floor balcony, a slim band of blue water was barely visible beyond the tall, swaying palm trees of the hotel’s inner courtyard, so we knew that an interesting walk lay ahead of us. After a relaxed breakfast, we navigated the dirt streets to the harbour where a huge Brown Pelican soared on the ocean breeze. 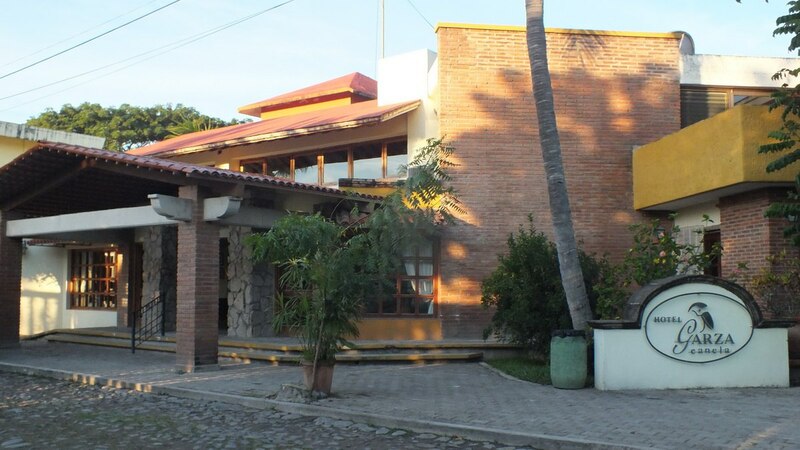 Our choice for accommodations was a lovely, family-run establishment called Hotel Garza Canela, located in the quiet fishing village of San Blas in the state of Nayarit. From the moment we arrived, friendly warmth greeted us, and topnotch hospitality surrounded us at every turn. Tucked about three hundred metres from the docks of the fishing port, the hotel was just removed enough from action central to ensure perfect quiet surroundings. With nary a thought to the walking conditions, Bob and I set off in our sandals to explore. The rugged cobblestone street outside the hotel swiftly gave way to broken stretches of cobblestone with loose rocks, and further sections of concrete sidewalk were so askew that walking became quite a chore. Still, after hours spent en route to San Blas the day before, from Zitacuaro in the state of Michoacan, it was good to be on our feet. 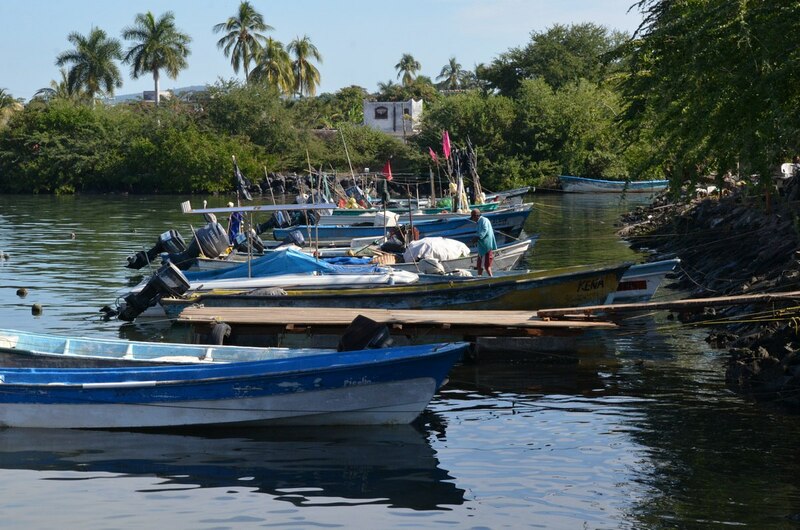 San Blas has a significant naval history and was once one of the busiest ports and shipbuilding centres on the Pacific Coast, but the shallow harbour is small and unable to accommodate more than a few large ships at one time. 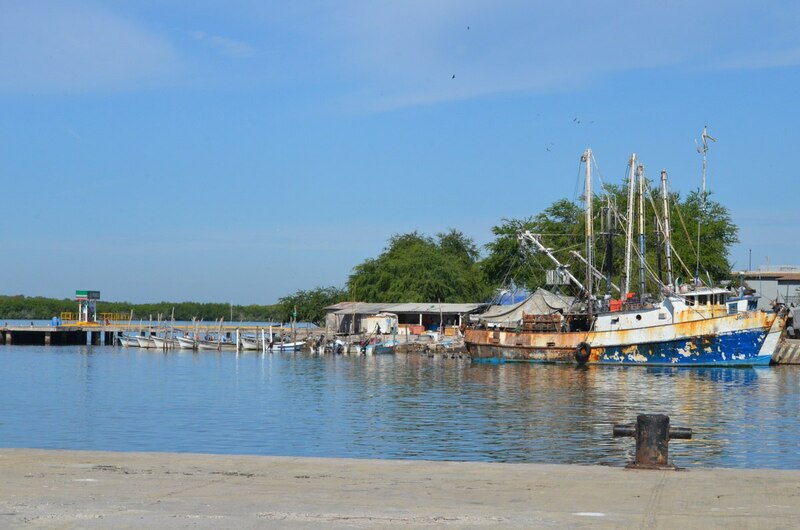 Together with the wet, hot and humid climate that supports plagues of mosquitoes in the rainy season, and San Blas soon reverted to the quiet fishing town that it is today. 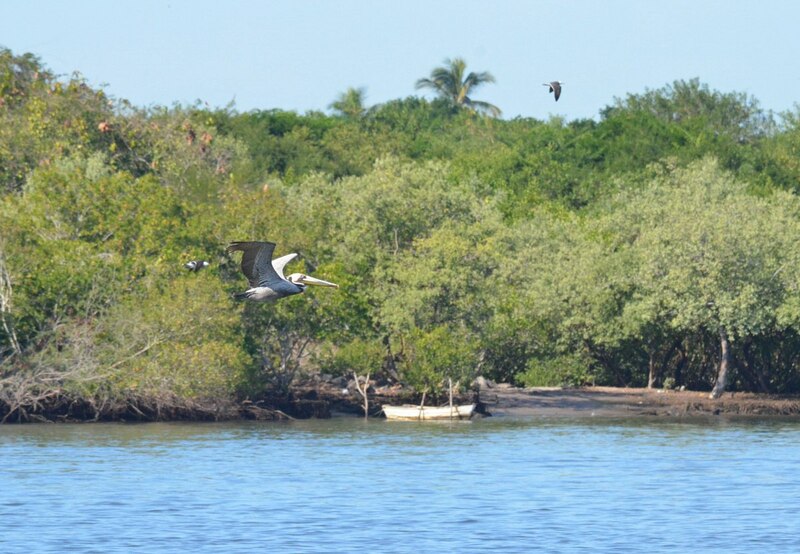 San Blas is surrounded by unspoiled natural surroundings that include mangrove swamps, estuaries, lagoons, and beaches that contribute to San Blas’s reputation as one of the western hemisphere’s significant hotspots for birding. Having just rolled into town late the evening before, we had not made plans yet for any birdwatching excursions so had to make do with the Brown Pelicans for the time being. Given the fishing vessels that work from the harbour, and pleasure boats that moor there, San Blas is a magnet for Brown Pelicans, and there were plenty on hand. 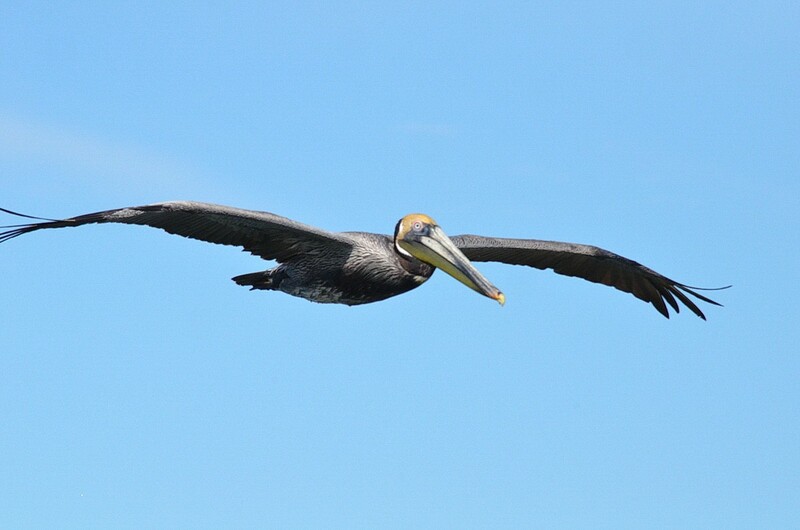 I was surprised to learn that, as recently as the early 1970s, Brown Pelicans were on the brink of extinction…victims of pesticide pollution…but now they are seen in large numbers; their population has recovered and stabilized. 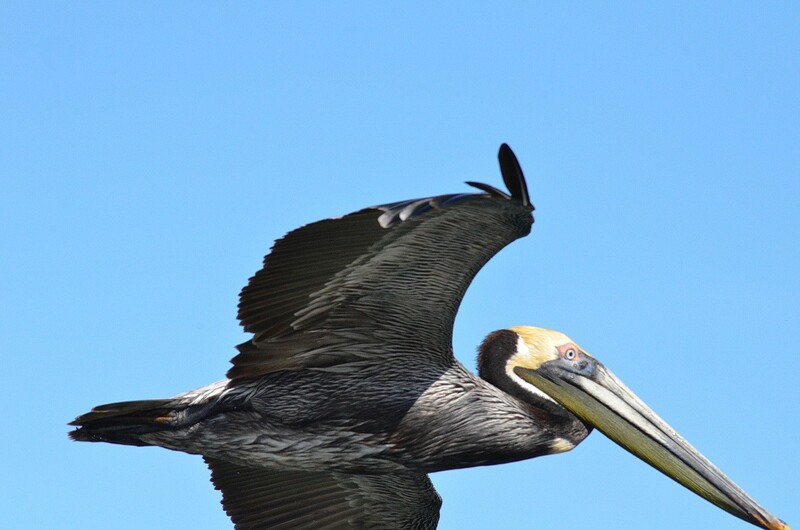 Brown Pelicans are unmistakable seabirds, and even though they are the smallest of the eight pelican species, they still are large birds with a wingspan of 1.8-2.5 metres (6-8 ft). 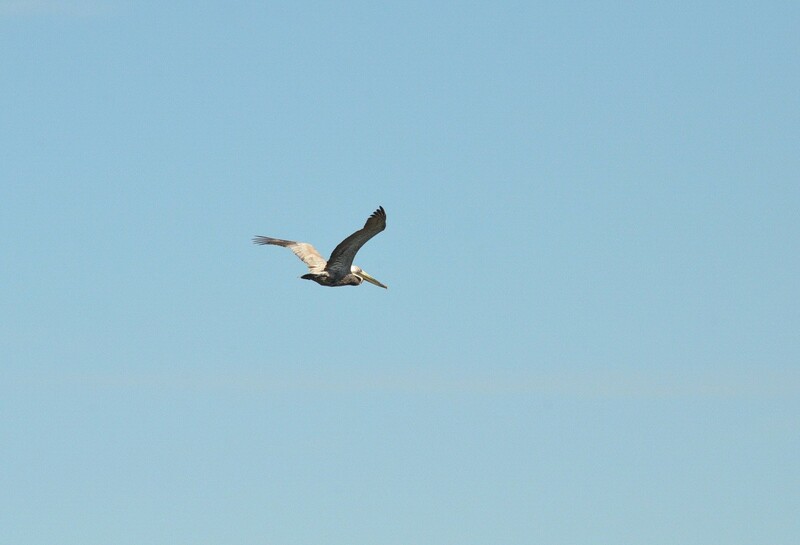 When gliding, the long, broad wings are bowed, as you can see in my photo. The Brown Pelican circled the small harbour seeking scraps from fishing boats, but there wasn’t much to be had since it was early in the morning, and most fishermen were still out on the water. 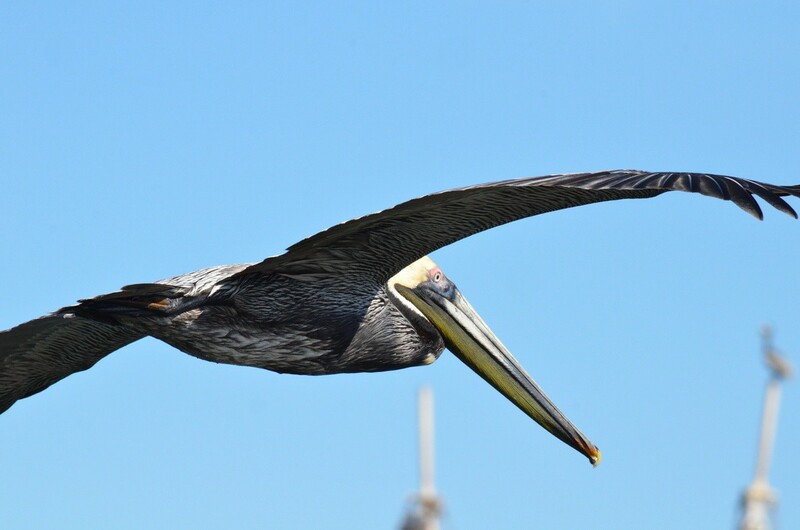 Brown Pelicans are very graceful in flight and appear much smaller than their true length, which is about 1.25 metres (4 ft), because they pull their heads back on their shoulders and rest their bills on their folded necks as they fly. It was so pleasant idling away an hour or so on the piers, and somehow soothing to watch the Brown Pelicans rise and fall in graceful echoes of the waves below, powerful wingbeats carrying them forward as they glided above the surf. 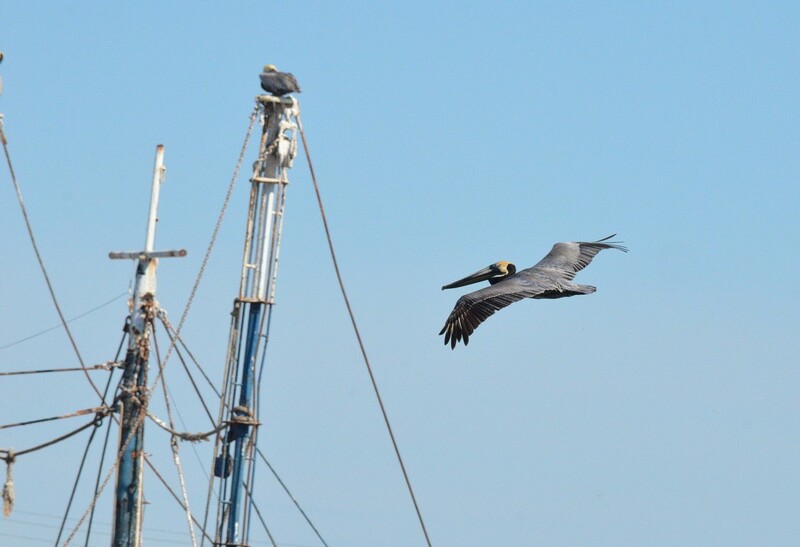 When Brown Pelicans are not diving for fish or soaring on updrafts, they are commonly seen standing around docks, jetties and piers of harbours and marinas. 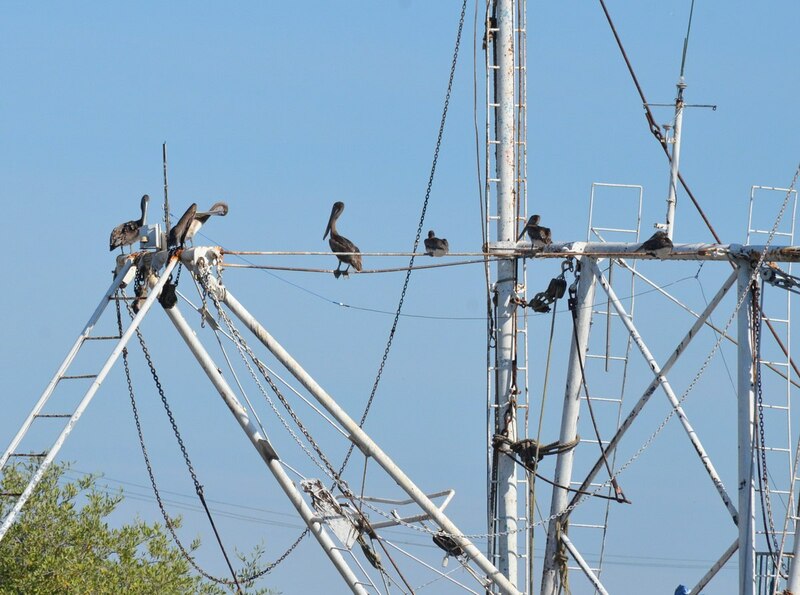 Much to the chagrin of boat owners, Brown Pelicans also find the many horizontal surfaces of boats’ rigging make perfectly adequate perches. It was to be one of the local boat owners that Bob and I would engage for an ecotour in following days. All we had to do was speak to Josephina at Hotel Garza Canela in order to line that up. She was a wealth of information and recommendations. 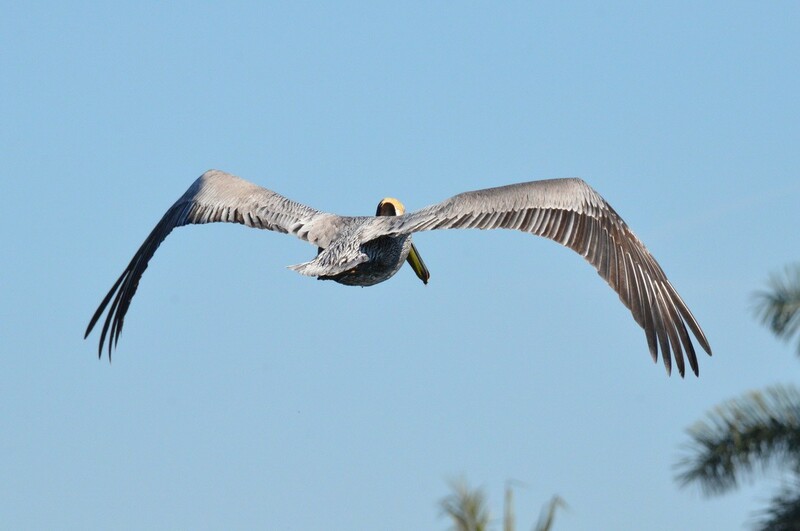 The flight of Brown Pelicans is deceptively slow with occasional powerful flaps to propel them forward, but they can actually cover about 48 kilometres per hour (30 mph). In contrast, these gregarious birds are quite clumsy on land where their oversized bills, long, sinuous necks, and large bodies combine to make them comically elegant. Bob and I were off to a good start in the tropical surroundings of San Blas.